Golly, this seems like a heavy meal, especially coming off a holiday week. So, I substituted turkey bacon for the pork bacon. I am not fond of things masquerading as other things, like soy cheese or tofurkey, and thought it was creepy how much the turbacon looked like a slice of budget lunch meat ham. Nevertheless, it was browned, along with some onion. Then I made a roux with milk, flour and heavy cream. All was going swimmingly until I had to add the Swiss chard to the pan to wilt it. If you don’t know, Swiss chard is a tough little beast, and by the time the shreds had wilted the cream sauce and bacon had stuck to the bottom of the pan. This created quite a mess, and also resulted in losing a good deal of the dip ingredients. Using spinach would have been more prudent. It also created a problem because I unwittingly used our last sponge to try to clean the skillet. Now we can’t wash any other dishes. 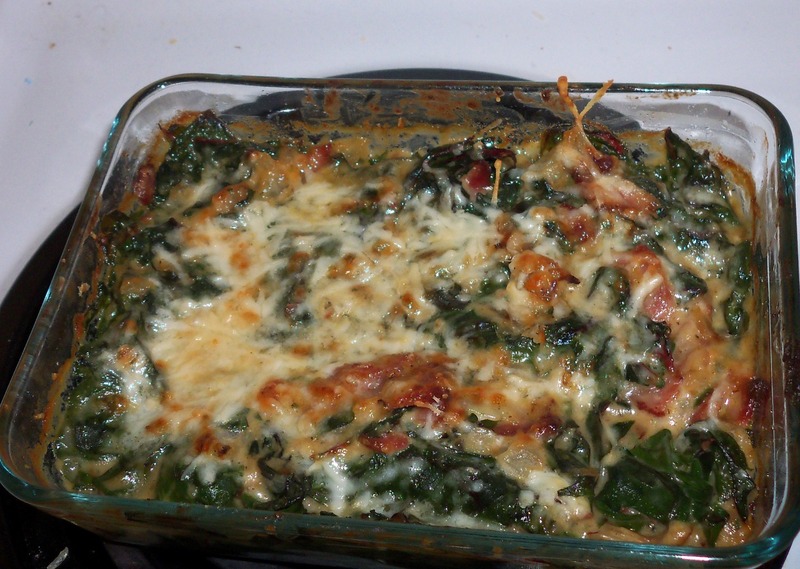 I baked the chard and the little bit of creamy bacon stuff, topped with Pecorino Romano, which I substituted for Parmesan. The flavor was good, but even with less creamy stuff added it was pretty oily and had a vaguely slimy texture once it cooled to room temperature. The Husband thinks the leftovers might be good over eggs for breakfast. Hmm. Even though I swore off chicken legs after the poached-legs-in-coconut broth incident, I bought some to use in this dish, along with some chicken thighs. Has anyone else noticed that thighs with skin are becoming impossible to find? What is up with that? The unsanctioned skinless thighs and legs (with skin) were browned, sort of, and removed from the pan while two plum tomatoes and red onions were browned along with some thyme sprigs. I then added some Marsala wine and reduced it. The chicken was added back to the pan along with some chicken broth and it baked for 35 minutes. 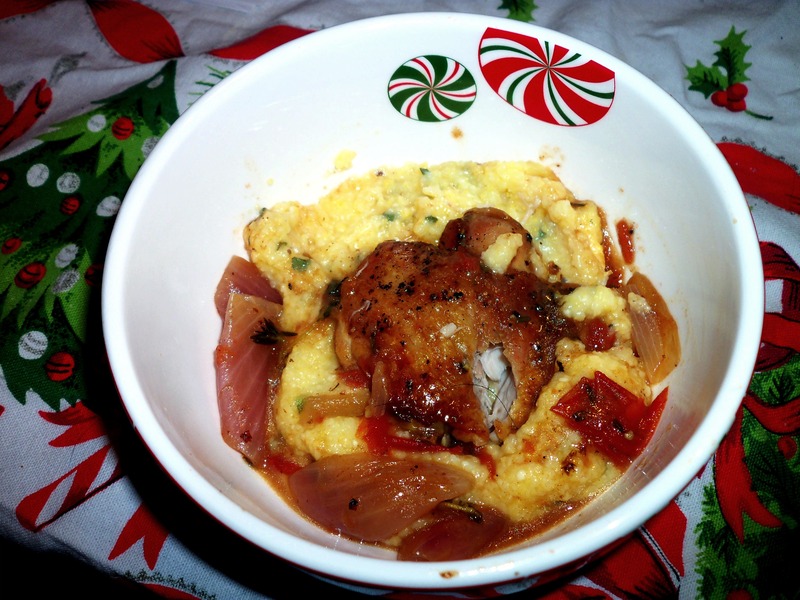 Cooking polenta is just like cooking grits. Is there any difference, really? I cooked the polenta, then added chopped sage in the last five minutes, plus some butter. Martha said to add 2 teaspoons of coarse salt to the cooking water; I added less and it was too salty. She is a total salt fiend. Together, the dish achieves a complexity of flavor that is lacking in most of the recipes in this cookbook. It is really quite good, but I prefer the Rachel Ray recipe with the chicken stew and manchego-enhanced polenta I wrote about last week, as Martha’s is a bit too sweet for me, despite having bought the driest Marsala wine I could find. The Husband was just not into the onions at all; he thought they were too sweet, which is odd considering that they were red. Martha opines that the heaviness of the meal demands a light dessert, but honestly, can’t we just skip it? The wine was kind of sweet, so let’s leave it at that, shall we? There was a delay in making the sautéed pears. If you know me in person you will not be surprised to learn that I burned my fingers pulling the skillet out of the oven. I then didn’t feel like wielding my fingers to make some stupid honey and pear thing. Didn’t we already make this dessert? I will probably post about it later in the week. ONE MORE MEAL, and I will have fulfilled my New Year’s Resolution. I can’t decide whether to hope it’s tasty, or horrible. The recipe involved bone-in pork chops, onions, Fuji apples, Armagnac, chicken stock, and butter. I am not going to give you the measurements for these ingredients, and I am not going to discuss its cooking method. I am taking a stand: it’s time to put an end to the whole Fruit with Pork thing. Now. If you want to put pork with some garlic, or herbs, or BBQ sauce I will support your right to do so. But I just cannot allow this fruity meat thing to continue. I wish I had a video of The Husband’s reaction to this part of the meal. There are many variations one can do of, “Oh, my god. This is soooo disgusting.” One can shake one’s head, and just repeat over and over again, “Oh, no.” Or say”Nuh uh,” several times over, then follow it with an “Ohhhhhhh, this is reallllllllly disgusting,” then an, “Oh my god! It’s gross! It’s really soooo gross” Then one can burst out laughing at how much one hates it. 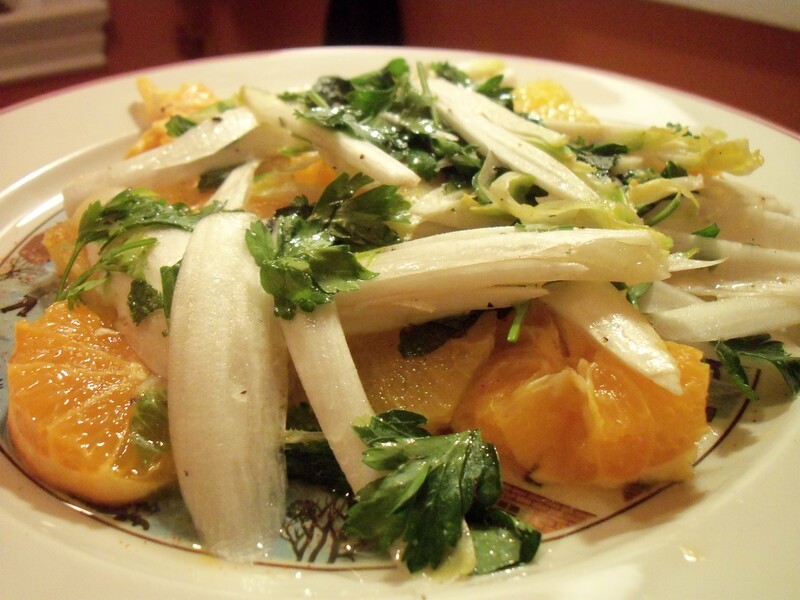 The fennel was not shaved, fyi. It was sliced, as was the celery. Kohlrabi is too fancy to be found at the several stores I tried, so we had to do without. 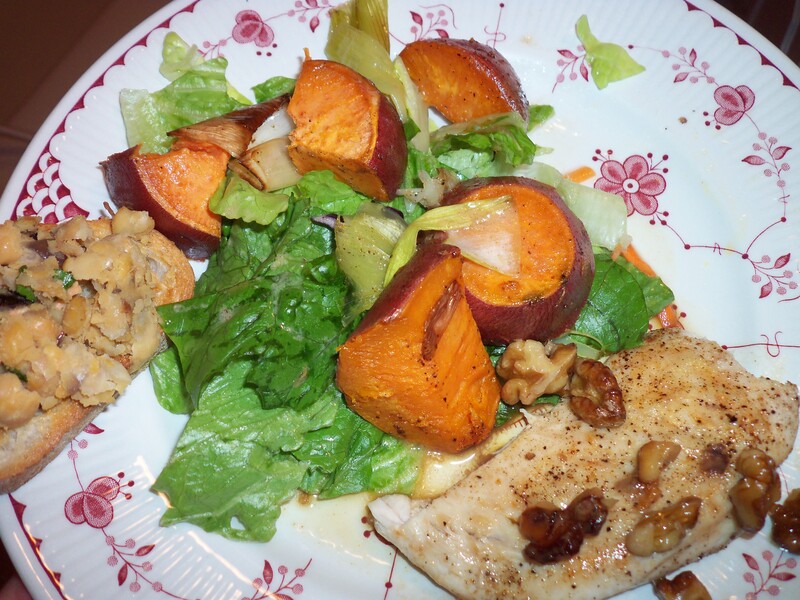 The dressing was apple cider vinegar, Dijon mustard (oh, how I have missed you), honey, and oil. I was supposed to use walnut oil, but didn’t for allergy-avoidance purposes. I didn’t hate it as much as I expected to. It was pretty quiet in flavor. I liked that it was crunchy. Most importantly, this is the last of the year of terrible salads! These were Yukon Gold potatoes, boiled with their skins on for a rustic effect. They were mashed with whole-grain mustard, chicken broth and olive oil. 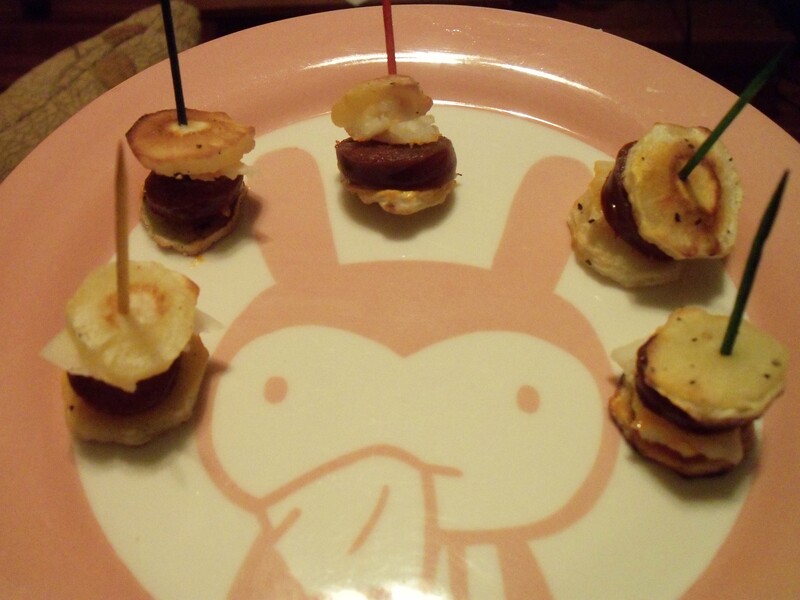 These were the best thing on the plate, which I suppose isn’t saying much, but they were tasty. I like mustard and think this is a fun idea for a side dish, if you were making kielbasi or something along those lines. We both normally hate maple, but we got some maple syrup from Trader Joe’s that is remarkably un-mapley in flavor. Otherwise I would have skipped this dessert. I whisked together egg yolks, maple syrup and vanilla, then slowly mixed in heated milk and cream. 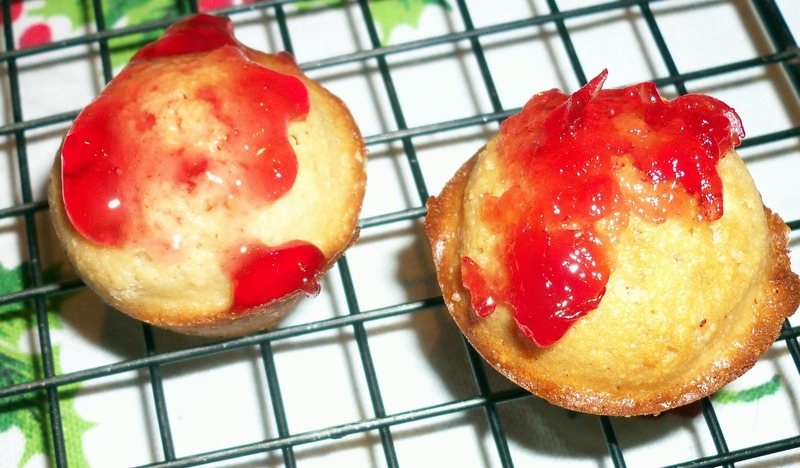 The mixture was baked in ramekins in a water bath, then chilled. I poured a little bit of maple syrup on top before serving. This was much better than I expected! The Husband took a bite and said, “OH, MY! I love this texture!!! !” It was silky smooth. Yum. As I said above, the flavors all went together, but that is not necessarily a good thing, in my opinion. The sweet pork was not cute, the salad was just ok, but the potatoes and dessert were good. 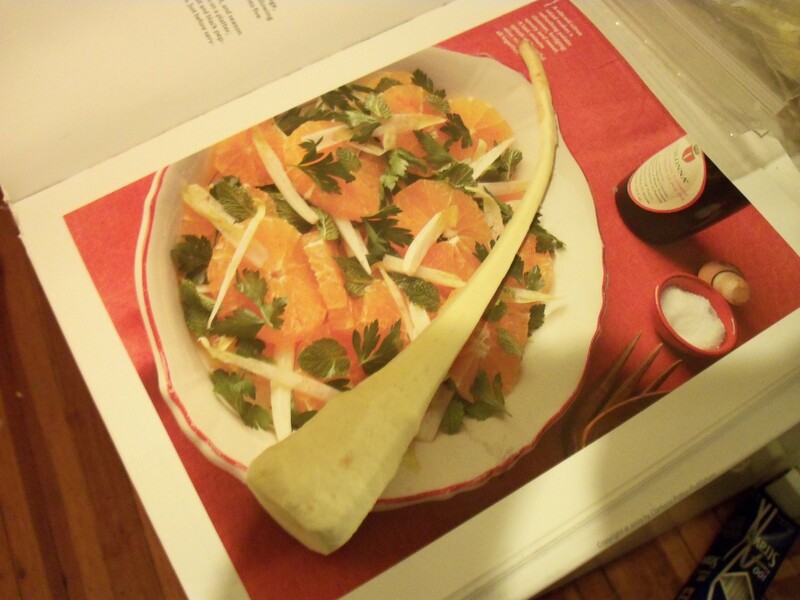 I could see people who like sweet meat and fennel really digging this meal. First off, I want to give kudos to Relay Foods (www.relayfoods.com). I ordered most of the ingredients for this meal from them, and they ran all over town, higgledy piggledy, picking up my quail, squash, Gruyère, wine, etc. And then I just popped over to the creepy, dark lot at the Science Museum to pick up my goodies, lovingly packed by a local hipster. This was my first time ordering from them and it won’t be my last. Faboo! Secondly, I would like it to be known that I cooked most of this meal at 5 am on a Tuesday. That’s right– 5 am! What happened was, I planned to cook the meal Sunday, but I got caught up cooking some stuff for an office thing and ran out of steam. On Monday night I had a bunch of errands and it was too late (at 8 pm) to start cooking. So instead I cooked it at 5 am. Ok, I see now how that doesn’t make much sense. But, Thing One woke me up with some vomiting at 4:30 am (yes, I know, speaking of vomiting on a cooking blog is not polite, but it’s the truth). 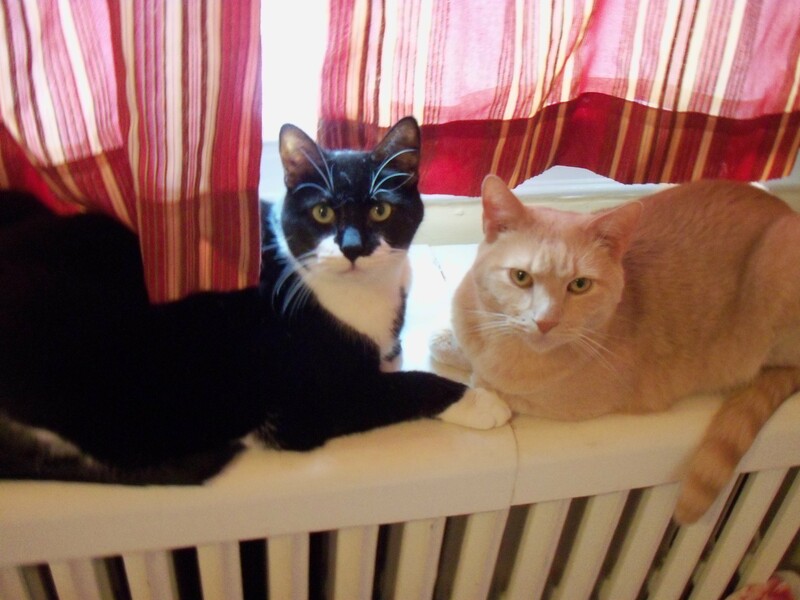 Why must my cats always puke in the middle of the night? Why not at 6 pm? If someone could invent a puke-less cat I bet it would be a very popular model. The diabolical puker (this time) is on the left. I woke up at 4:30 am and couldn’t go back to sleep, so I decided to cook my quail. I cut out their backbones, and chopped off their scrawny little necks while wearing my polka-dotted PJs–quite the surreal moment. If you’re the type to wish you starred in a reality show, this would be the thing you’d hope they’d get on film. While that was happening I figured I could just go ahead and roast the figs, and what the hell, why not make the rice pilaf, too? I drew the line at roasting the squash, though. I have my limits. Plus, as soon as the sun came up I had to walk Miss Pooch. The recipe called for de-boned quail, which I didn’t even bother to look for. I just ordered the package off Relay, which got it from the Mediterranean market on Quioccasin. After they were butchered it was a matter of salting and peppering them, and brushing them with oil. I was supposed to cook them in a grill pan, which I don’t have because I just use my grill, but not at 5 am when it’s 20 degrees out. I flattened them with a cast iron skillet, per the instructions. They got a nice crispy brown crust. The sauce involved roasting Brown Turkey figs (the recipe called for Mission, but I couldn’t get those), capers and pine nuts, then tossing them with balsamic vinegar. The sauce was great! It really helped out the quail in the taste department. Super simple–never buy Rice-a-Roni again, people! Melt butter, sauté broken pieces of angel hair pasta, then a chopped onion, then throw in the rice and coat with butter. Add water and simmer until done. This was simple, but I really liked it with the quail and fig sauce. I made the squash later in the day, after I got home from work. It involved baking halved squash filled with cream, in which some fresh sage and sliced garlic were simmered briefly. 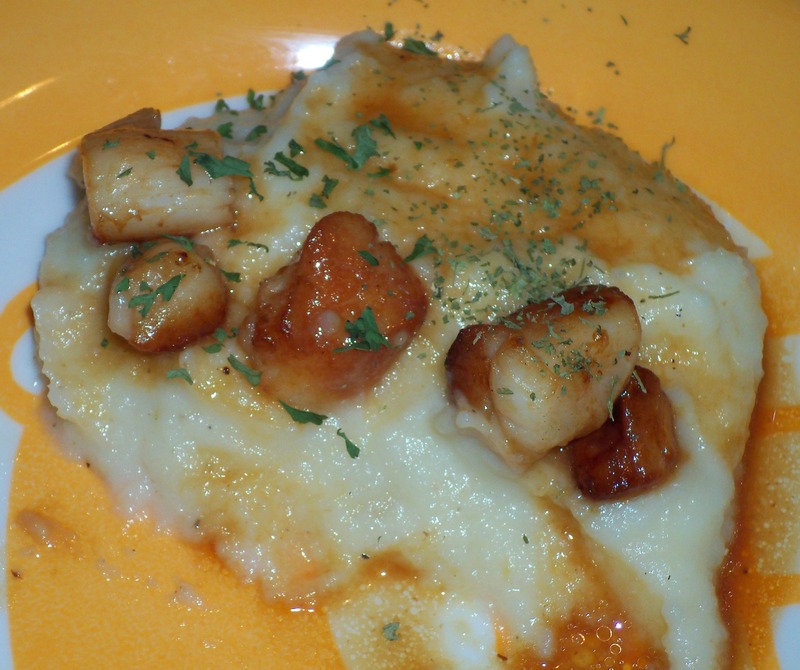 Then the Gruyere was added and it was cooked until brown. This was kind of meh for me. I think my squash was too small, and the cream filled the entire cavity. The ones in the photo in the cookbook don’t have much cream in them at all. So, it mainly just tasted cream-y and bland. The Husband really resented it, as he felt the flavor detracted from the quail. 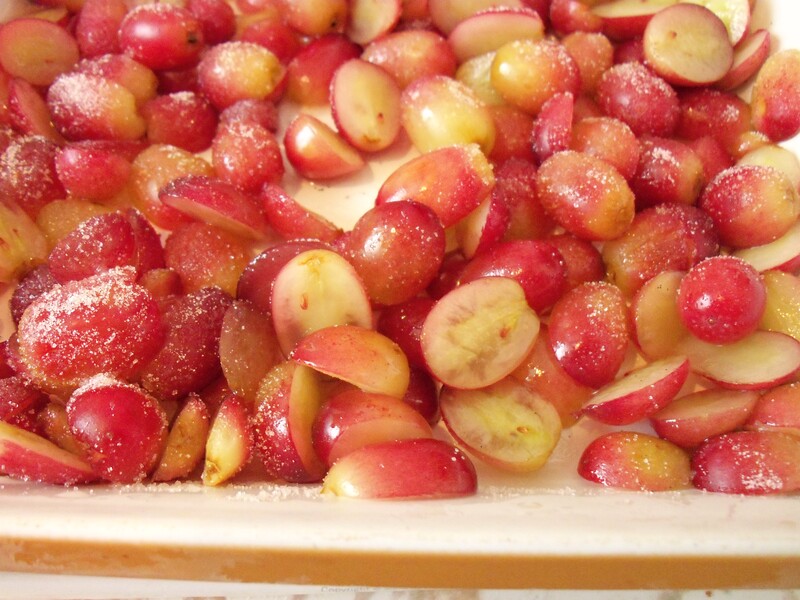 This recipe is in the running for most stupid dessert of the year: Halve red grapes, put in dish, toss with a bit of Sauternes, sugar, and water, then freeze. Stir with fork and serve. Ok, Martha. WHY are we eating ice in a fall menu?!?! It was 20 degrees when I made this (the night before the quail incident). Why not a cranberry orange bread? Or anything, really, as long as it wasn’t icy. It actually wasn’t even all that icy, like the cherry ice recipe. It was mainly just odd tasting frozen grapes. 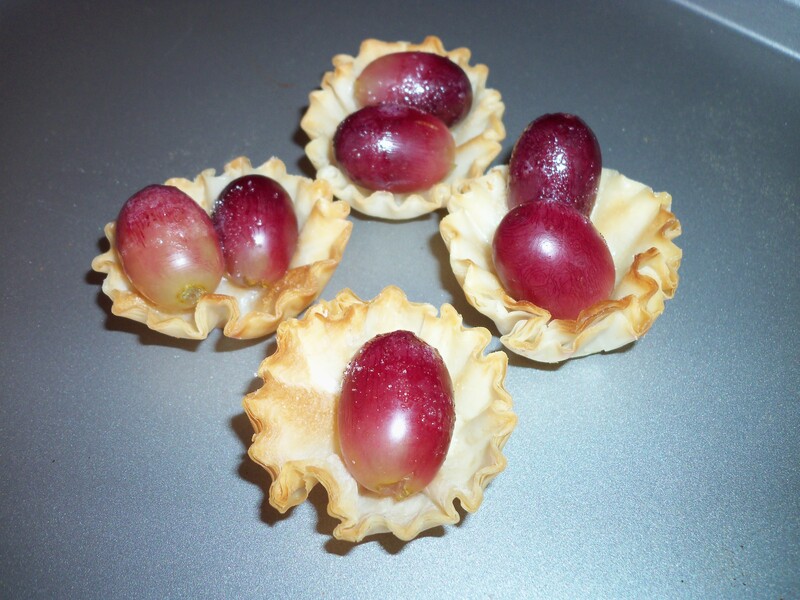 I didn’t like the taste of the Sauternes, and it ruined my precious organic grapes. This would be refreshing in the summer if it didn’t taste terrible. 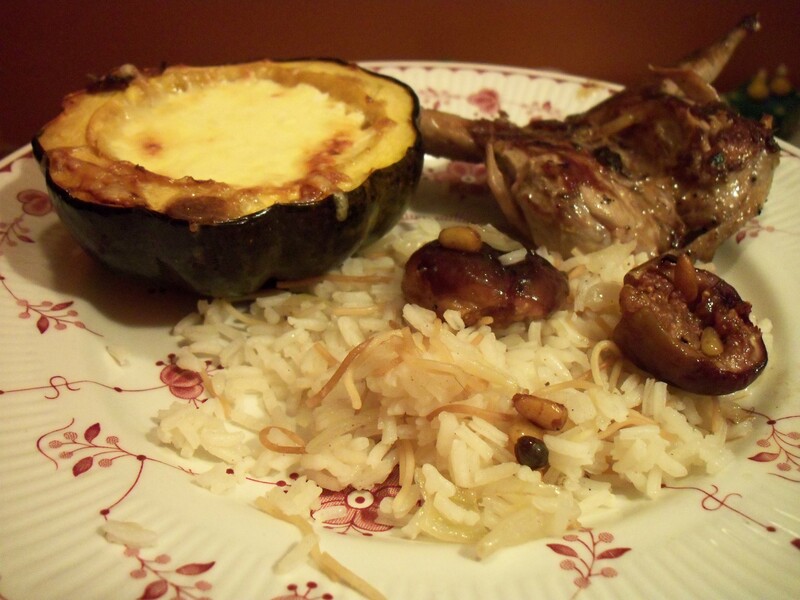 We really liked this meal when it was just quail, fig sauce, and rice pilaf. But the squash was disappointing, and the dessert pissed me off. Way to ruin things, Martha. After days and days of holiday and birthday treats, I was reluctant to make a Martha meal, but to (very, very loosely) paraphrase Winston Churchill, the only way through it is to cook it. The recipes are all on her site here. She recommends this as a buffet style dinner party. Soup on a buffet seems impractical and messy. The photo shows a giant brioche, but of course we will never know how to make that, as we will be making raw pears instead. Pity. The funny thing about this recipe is that onions + cauliflower + watercress= thin broccoli soup! It was a bit slimy, from too much butter used to saute the onion, but was otherwise ok. It was shocking how much it tasted like broccoli. The Husband hated it at first, but when he added a huge amount of white pepper he liked it much better. He says it will make a good breakfast. Yes, I said breakfast. Ask him. Unfortunately, the beans I got were mealy and this didn’t have much flavor. It was a disappointment, but at least the fennel was cooked enough to not offend. Normally, I am thrilled with the idea of a cheese plate; I prefer cheese to most desserts, in fact. But it seemed excessive to have it with this meal, as the menu included pork, beans, nuts and cheese. That is a lot of protein, yes? I have my own salty/sweet nut recipe, and this one used maple syrup. Our maple syrup is remarkably un-mapley, so that is the only reason this passed muster. 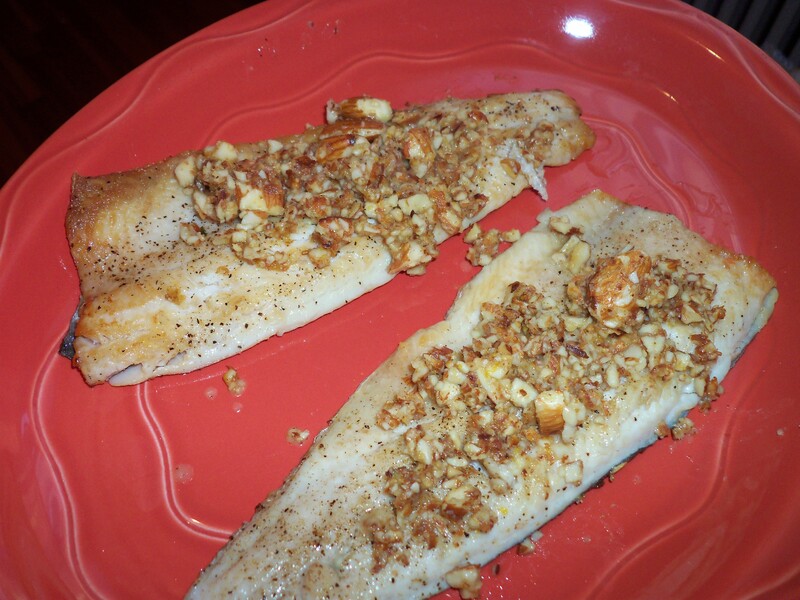 We substituted pecans for the walnuts, and they turned out very tasty. This next part is pathetic–I couldn’t find the cheese in the frig as I think I left it at our friend’s house on Thanksgiving. So we were forced to pick the cheese crumbles off the leftover salad and eat it with the pear and the nuts. (It was 9:30 at night, so I wasn’t in the mood to go to the store!). It was fine, because I was actually so stuffed from the soup, pork and beans that I could only eat a tiny bite anyway. Some items were better than others, but overall the flavors at least matched.